On April 6, 1970 owner Carroll Rosenbloom of the Baltimore Colts announced that Don McCafferty would succeed Don Shula, who had departed to become head coach and general manager of the Miami Dolphins, as the team’s head coach. The 49-year-old McCafferty was an offensive backfield coach who was elevated to succeed Shula after the team rejected 28 applications in all – a process that had taken six weeks. Reportedly, George Allen of the Rams had inquired and the Colts had reached out to successful college coaches Ara Parseghian of Notre Dame and Penn State’s Joe Paterno. McCafferty received a one-year contract, adding further to the sense that he was on shaky ground in succeeding Shula. McCafferty played one season of pro football with the Giants in 1946 before going into coaching, starting at Kent State for ten years. He joined the Colts in 1959 under Weeb Ewbank as an offensive ends coach and scout. Tall and low-key, McCafferty was also considered to have a good mind for offense. The team that McCafferty was inheriting was fundamentally sound, and was just two years removed from a NFL Championship – although it was marred by the upset loss to the AFL Champion New York Jets in the Super Bowl. Nevertheless, Shula revived a squad that had begun to slide after winning back-to-back titles under Ewbank in 1958 and ’59, and the record from 1963 to ’69 was 71-23-4 for a healthy .755 winning percentage and included two Western Conference titles and a tie for one other. Still, there were causes of concern going into the 1970 season, the first with the AFL merged into the NFL and the Colts now part of a different conference and division. The team’s record had dropped from 13-1 in 1968 to 8-5-1 in ’69. QB Johnny Unitas was an all-time great but was also 37 years old and increasingly brittle. His backup, Earl Morrall, wasn’t much younger. WR Jimmy Orr was 35 and TE John Mackey was coming off knee surgery. While HB Tom Matte was capable, injuries had depleted the running backs in 1969, in particular FB Jerry Hill, and FB Norm Bulaich was taken in the first round of the draft. The defense had also slipped, and there were concerns about the pass rush and the revamped linebacker corps that included Mike Curtis, moved from outside to middle linebacker, and Ted Hendricks, a converted defensive end. Despite the doubts, the Colts topped the AFC East with an 11-2-1 record. Unitas stayed healthy and the wide receiving corps picked up veteran Roy Jefferson from the Steelers, whose presence helped young Eddie Hinton to find his stride – Hinton led the team with 47 catches for 733 yards (15.6 avg.) and five touchdowns and Jefferson contributed 44 receptions for 749 yards (17.0 avg.) and seven TDs. Mackey split the tight end duties with Tom Mitchell, also with good results – they combined for 48 catches. The running game was the offense’s weakness, not helped when Matte was lost for the year in the opening week, but Bulaich came along as the season progressed and led the club with 426 yards. DE Bubba Smith finally achieved his potential and provided a strong pass rush. The linebacking corps came together impressively as Curtis excelled in the middle, Hendricks was outstanding, and Ray May played well at the other outside position. Safeties Rick Volk and Jerry Logan also were star performers in the defensive backfield. The special teams did their part as kickoff returner Jim Duncan led the league (35.4 avg.) and punt returner Ron Gardin was second in the conference (11.8). Punter David Lee had a typically solid year and rookie placekicker Jim O’Brien replaced the fading Lou Michaels and ended up making the winning field goal in the Super Bowl. While there was muted praise for the Colts – they had not been a particularly dominating team throughout the season and won a Super Bowl notorious for sloppy play – still they had achieved a championship. The defense of the NFL title appeared tenuous well before the 1971 season began when Unitas suffered a torn Achilles tendon during the offseason that was considered to be career-threatening. He did return, however, and eventually took over the starting job from Morrall as the Colts went 10-4 and finished second in the division, qualifying for the playoffs as a Wild Card entry and making it to the AFC Championship game, where they were dethroned by Shula’s up-and-coming Dolphins. The running game benefited from the return of Matte and continued improvement of Bulaich as well as the addition of rookies Don Nottingham and Don McCauley. But, paradoxically, the receiving corps declined badly. Thanks to a salary dispute, Jefferson was traded to Washington and Hinton’s performance dropped off significantly. Tom Mitchell ended up leading the team with 33 catches. The defense was still solid, however, and led the AFC in interceptions (28). Big changes were about to come to the organization, starting with the owner Rosenbloom in effect trading franchises with Robert Irsay, who had just purchased the Rams. Irsay hired a new general manager, Joe Thomas, who began systematically dumping veterans from the roster. The team got off to a 1-4 start and McCafferty, who was unwilling to bench Unitas, was fired and replaced by assistant coach John Sandusky, who followed orders and installed the nondescript Marty Domres as the starting quarterback. Just two years removed from a championship season, McCafferty was gone and the Colts fell to 5-9. The quiet McCafferty, who was referred to as “Easy Rider” by his players, ended up with a 22-10-1 regular season record with the Colts and was 4-1 in the playoffs. Easily overlooked with his unaffecting demeanor, he nevertheless had the respect of his players. 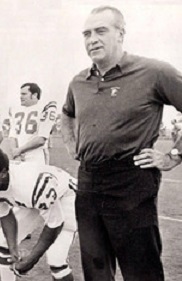 McCafferty returned to NFL coaching with the Detroit Lions in 1973. They went 6-7-1 in that season but sadly, the following July, he died of a heart attack at the age of 53.